Drugged Driving Kills. Then Why Are We Still Doing It? DriversEd.com has released a new study on the awareness and prevalence of marijuana-impaired driving, finding that while an overwhelming number of Americans have an understanding that driving after smoking or ingesting marijuana is dangerous, one-fourth of them have admitted to doing so themselves. According to DriversEd.com’s 2019 Cannabis and Cars Report, 58% of Americans believe that legalized recreational marijuana use leads to increased danger on roads, and 91% of Americans believe marijuana can impair a driver’s driving ability. Even so, 20% of drivers admit to driving after smoking marijuana, and 6% admit to driving after ingesting it. This may come as no surprise, as 34 states, District of Columbia, Guam, Puerto Rico, and the US Virgin Islands have approved a comprehensive, publicly available medical marijuana/cannabis program as of March 2019. Marijuana is more out in the open than it ever has been before, however, its accessibility is preceding development of proper oversight. 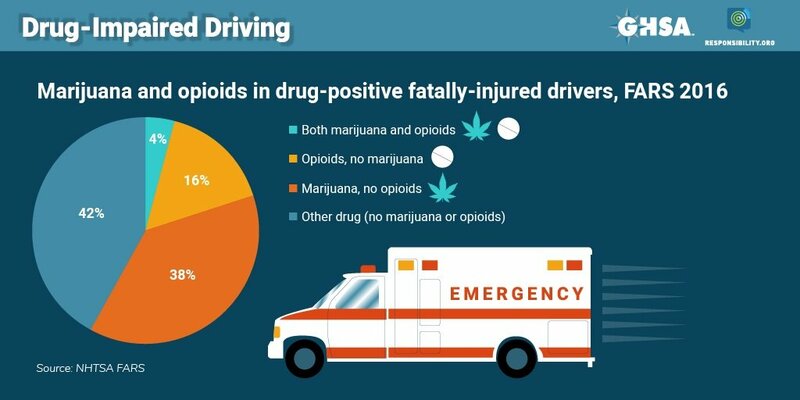 Without correct traffic safety measures in place, the prevalence of drugged driving is growing, as drivers likely believe they won’t get caught, aren’t noticeably driving dangerously, or don’t consider marijuana’s side effects to be risky enough to stay out of the driver’s seat. According to the Brain Injury Society, significant cognitive impairment begins the moment marijuana is consumed. THC, or tetrahydrocannabinol, is the chemical responsible for most of marijuana's psychological effects. It interferes with the natural communication of cannabinoids between neurons in the brain, especially in the cerebral cortex—which plays a huge role in how memory, thinking, and consciousness are affected. A 2018 Governors Highway Safety Association study, Drug-Impaired Driving: Marijuana and Opioids Raise Critical Issues for States, found that in 2016, 44% of fatally-injured drivers with known results tested positive for drugs, up from 28% just 10 years prior. More than half of these drivers had marijuana, opioids, or a combination of the two in their system. The best way to reduce drugged driving, according to Mothers Against Drunk Driving (MADD), is the use of Standardized Field Sobriety Testing (SFST), the foundation of impaired driving detection and enforcement for 800,000 law enforcement officials across the country. Some states, however, do not require SFST training for officers assigned to patrol functions. As MADD says: Myths and misinformation are part of the problem. Get the facts—and share them with your loved ones, especially young adults. Why? More than one-third of teens mistakenly believe they drive better under the influence of marijuana. The 2019 Cars and Cannabis survey was conducted online using Survey Monkey. One thousand and sixty three participants were polled, spanning across the United States, with the U.S. driving population represented by the 997 respondents who, before completing the survey, answered that they have a driver’s license. The demographics of those polled represented a broad range of household income, geographic location, age, and gender.